Sarbanes Oxley (SOX) which was enacted on the 29th day of July, 2002 and is also popular for its other names Corporate and Auditing Accountability and Responsibility Act and Public Company Accounting Reform and Investor Protection Act refers to a federal law in the US which sets newer and more enhanced laws and standards designed for public company boards, public accounting companies and management in the US. It sets newer standards that are primarily designed for corporate accountability and newer penalties for any committed acts of wrongdoing. The Act also modifies the procedures used by corporate executives and boards when it comes to interacting with one another and with any other corporate directors. It is capable of removing the unawareness of financial issues usually used by CFOs and CEOs as their defense while also holding them accountable in making sure that all financial statements that they develop are highly accurate. SOX also works in specifying newer responsibilities in the field of financial reporting such as strict adherence to the most recent internal procedures and controls that are primarily designed to help authenticate and validate financial records. The major objective of Sarbanes Oxley is to significantly improve corporate governance while also strengthening corporate accountability. This can be successfully accomplished by first strengthening and formalizing internal balances and checks within different business organizations, instituting different and more effective levels of sign-off and control designed to make sure that financial reporting and transactions are fully disclosed and offering solutions that promote full transparency for corporate governance and transactions. Gaining a stronger background about the Sarbanes Oxley Act is now possible by taking part in the Sarbanes Oxley certification program which is available at Brainmeasures. 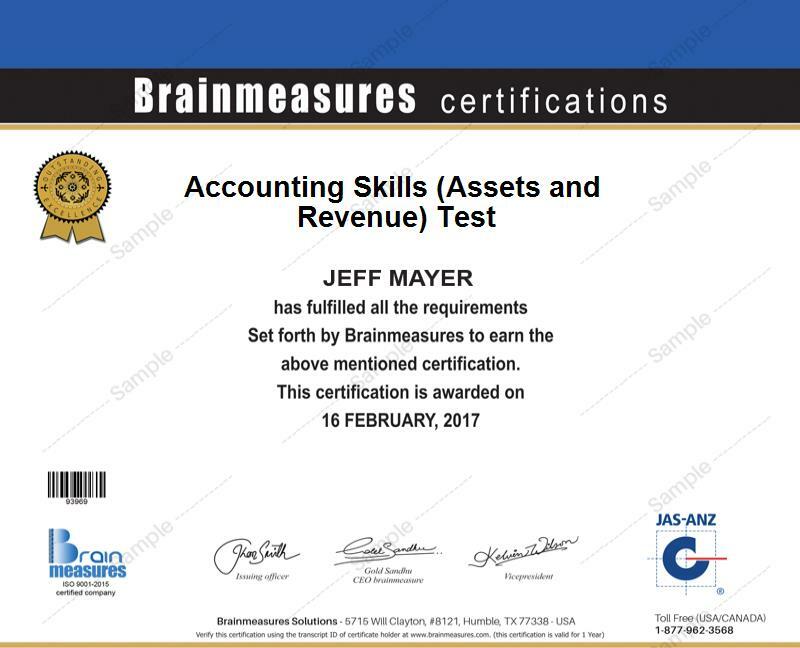 Brainmeasures has already received excellent reputation in the field of providing online certification courses to the public so you have a guarantee that its Sarbanes Oxley course is also one of its many highly commendable courses. This certification course gives you the opportunity to access a kind of Sarbanes Oxley training which helps you understand all the concepts related to the act as well as all the standards that form part of it. It improves your awareness on the different strategies that you can use when it comes to taking full advantage of SOX especially in improving the corporate accountability of your business. As soon as you receive your Sarbanes Oxley certificate from Brainmeasures, you can start showing the whole industry that you are a certified professional in this field and you know exactly what the SOX Act is all about. Enrolling in the Sarbanes Oxley certification program offered by Brainmeasures is capable of offering numerous advantages to hundreds of professionals and individuals regardless of the specific industry where they are in. The certification program is more suitable for professionals who are more concerned about compliance matters relevant to the Sarbanes Oxley Act including directors, managers and various departments of an organization including financial reporting, internal audit, auditing, accounting, risk management, corporate governance, corporate compliance and legal affairs. The Sarbanes Oxley certification that you will receive from Brainmeasures after taking up the program is also a huge help when it comes to significantly increasing the level of your salary. You can expect your Sarbanes Oxley certification to be useful in getting the position of a SOX auditor which allows you to earn around $63,000 to $88,000 annually. You may also work as a SOX consultant which gives you the opportunity to receive around $79,000 to $95,000 annually. If you work as a SOX analyst, then expect this position to offer you around $72,000 to $103,000 per year.